What we call the Nexus 7 2 (2nd Generation) was only released a few weeks ago and already talks of a new Nexus 10 2 are being discussed. It would be pointless to talk about specs as this would be based on speculation and we will come back to these at a later date, but what would be interesting is the manufacturers name stamped on it. The current Nexus 10 is by Samsung and this brings us to the debate of the new manufacturer for the Nexus 10 2, will it be Samsung again, could it be Asus or even Sony? Phones Review would have to suggest Samsung would manufacture the Nexus 10 2 and not Asus, Sony is definitely out of the question and we will explain why we have come up with these assumptions. Asus released the Nexus 7, the Nexus 7 2 was also by Asus, so it stands to reason for the working success to continue with the Nexus 10 2 by Samsung seeing as they have the first Nexus 10. 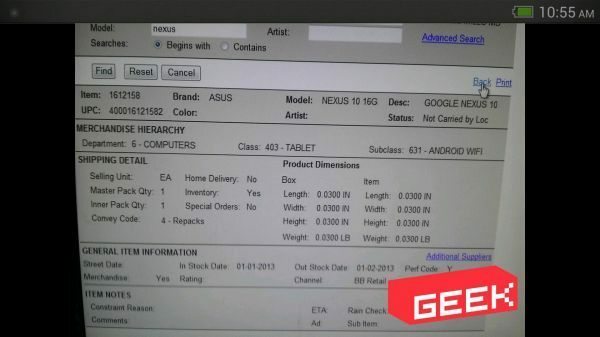 If you look at the screenshot below courtesy of Geek.com it shows that the Nexus 10 2 will have the Asus branding, Google are very close with Asus with the Nexus 7 and with rumors of a larger tablet in the pipeline, but we still do not believe Asus will be behind the 2nd generation Nexus 10, we will stick to our guns and suggest Samsung. We cannot ignore the possibility of Asus manufacturing the Nexus 10 2, nor can we Samsung. Look at the screenshot, it says in stock date 1.1.2013, and then it says out of stock 01.02.2013, so that means within one month it was out of stock, totally unrealistic and a screenshot to get people’s hopes up. 16G Google Nexus 10 WiFi manufactured by Asus is still a mystery and we would love to now where Geek.com got this information from — Do you think Asus or Samsung will build the Nexus 10 2? I pray its made by Asus. Samsung makes horrible quality tablets, Asus is probably the best tablet maker in my opinion. You clearly have never had a run in with ASUS support. Samsung would be a great candidate since they already make 2560×1600/1440 panels and did a great job with the Nexus 10.